When your sweetheart has finished the freezer bag of scones you made for him and turns to you to tell you plaintively that they made each of his mornings a little bit better warmed up in the oven and munched on the way to work along with a mug of spicy tea, I defy you to not run back to the kitchen and practically stub your fingers while yanking out the ingredients to make up another batch for him. Because Ben indulges my obsession with trying Every Single Clipped Recipe In My Possession, I was able to branch out from the original winning group of scones and try a different recipe that's been burning a hole through my notebook. 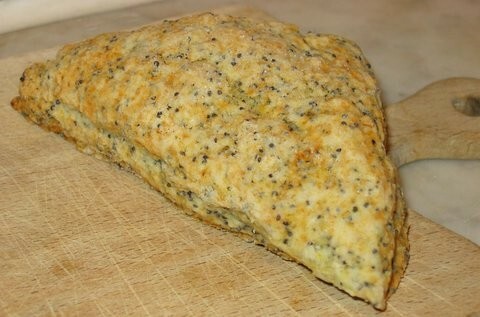 It was requested by an LA Times reader after having tried a lemon poppy seed scone at Beverly Hill's Maple Drive. Instead of buttermilk, the recipe calls for cream, which makes for a richer scone. And an inordinate amount of poppy seeds, which, when purchased from a grocery store in New York City instead of Penzey's and plucked out of the grocery bag by the afore-mentioned sweetheart who also, have I told you, doubles as my financial planner, caused a reaction of the bug-eyed and gasping sort as soon as the price tag was spotted. He was appeased, but not much, when I told him what the poppy seeds were for. The scones were not too sweet, faintly pungent from the lemon peel, with an appealingly bitter note from the poppy seeds. They're too dense for my kind of breakfast, but if cut and baked into portions small enough, would be great with an afternoon cup of tea. I actually think they'd be perfect split and soaked in sliced strawberries and cream. Ben thinks they're delicious just as they are. And that's really all I wanted to hear. 1. Mix the flour, one-half cup sugar, poppy seeds, lemon zest, baking powder, baking soda and salt in a large bowl until combined. In a separate bowl, whisk together the egg and the whipping cream. Stir the cream mixture into the dry ingredients just until combined; do not overmix. 2. Heat the oven to 350 degrees. Place the dough on a lightly floured surface and gently pat into a 1-inch-thick round. Cut out scones with a 3-inch round cutter that has been lightly sprayed with nonstick spray. Place the scones on a parchment-lined baking sheet, several inches apart. Brush the tops with melted butter and sprinkle with the remaining tablespoon sugar. 3. Bake the scones 20 to 24 minutes, until lightly golden on the sides and bottom.